Posted on June 15, 2012 by Ronald Patrick Raab, C.S.C. I remember today an elderly woman from the front pew of my home parish when I was in high school. She was a stocky woman with tightly curled hair under a hair net and she walked with the aid of a cane. I remember her hobbling to her pew before the early morning Sunday Mass. She seemed feisty, assured of her place not just in the first pew in Mass, but in her life. I do not remember her name. I do remember her face fired up with faith. After Mass one day, she slowly walked up to me leaning on her cane carrying something in her hand. She handed me a devotional card of the Sacred Heart. She told me to pray the prayer on the reverse side every day. She told me she had heard that I was thinking of the seminary. The elderly woman of faith told me to carry the card in my wallet and to always rely on the Sacred Heart to get me through tough times. She handed me the card with great conviction, with the authority that not only did she have tough times in her life, but that she had relied on the Heart of Christ for healing and consolation. I never spoke with her again after that simple exchange. I carried that card in my wallet until the devotional card completely disintegrated many years ago. I do remember the prayer. This is the prayer I pray today with a different yearning from my own heart. Now that I am an adult, well beyond the naive inklings of a vocation to priesthood, I understand the suffering and pain of my own heart and even more the ache of people who live in grief, who battle addictions and who make their homes outside. I now pray this prayer for people who feel they may never experience the consolation of love and forgiveness. 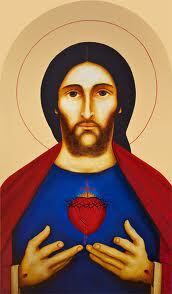 I joined the Congregation of Holy Cross that celebrates the Sacred Heart of Jesus as our patronal feast. Today, I remember the faith of an elderly woman in the front pew and I pray for every person whose burden rests in Christ. Even though I no longer carry the prayer in my wallet, I want to pass on the devotional prayer which now seems like a way of life. Today is our parish feast day! Blessings to all in the Tri-Community. This is a reflection on the Sacred Heart I wrote two years ago.